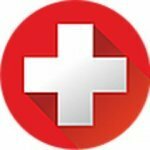 [ANN][PRE - ICO][ICO] Doc Coin: BlockChain protocol for Telehealth. DocCoin is worldwide medical system designed on blockchain and smart contract technologies. 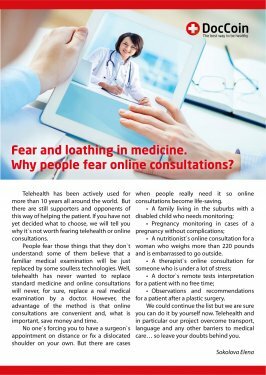 It’s digital alternative to modern healthcare world. DocCoin will gather patients,doctors,insurance companies,hospitals,rehabilitation centers and other parties of healthcare world into one ecosystem that will change the future of health industry. DocCoin will help patients in receiving high-quality medical services, doctors will receive additional practice to improve their skills and will get additional money for services provided, insurance companies will decrease overall number of fraud cases. The pre-sale will begin on January 25, 2018 and will end on February 2th 2018. There is a 50% discount available throughout the pre-sale. Tokens will be distributed after the crowdsale ends. The crowdsale will begin on February 9, 2018 and will end on March 11, 2018. 80,000,000 Doc tokens will be available for purchase and tokens will be distributed shortly after the end of the crowdsale. There are a total of 200,000,000 DOC tokens outstanding, with 140,000,000 available throughout the pre-sale and crowdsale. Any tokens not sold during the pre-sale will be available for purchase during the crowdsale. Tokens will be distributed to contributors shortly after the crowdsale is completed. a necessary step in the modern world where things change fast. Using blockchain for medical services opens the door to a new business-models, creates new analysis tools for health services and related fields. Blockchain system offers a universal set of tools for cryptographic data integrity assurance, standardized audit and decentralized contracts to access data. Nowadays medical services are a nightmare for all parties involved in healthcare sector. There are a number of global problems on the road to a healthy world. Compensations are calculated arbitrarily and in non-transparent way, fraud occurs more often. The patient's medical data might be lost and no one is responsible for the safety storage. Consultations with a highly qualified medical specialist from another country cost a lot of money. Expensive medical services make a simple medical help unaffordable for a lot of people around the world. DocCoin is a global medical system developed on the blockchain basis and smart contract technology. This is the digital alternative in the healthcare world. The purposes of DocCoin system are creating a more competitive environment in providing medical services and making access to high-quality medical services easier and more affordable for people around the world. .
index servers that synchronize information with each other. What solutions does DocCoin offer to solve the main problems of healthcare world? Service helps a client to select a specialist suitable for him as a client can choose qualification of a doctor, price and many other parameters that will allow a client to receive high-quality medical help. We keep your medical data secure and you can access it online in any time. Why do we use smart contract technology? Secure transfer of medical data to third parties. Thanks to the decentralized network, DocCoin helps to reduce medical services costs and saves your time. 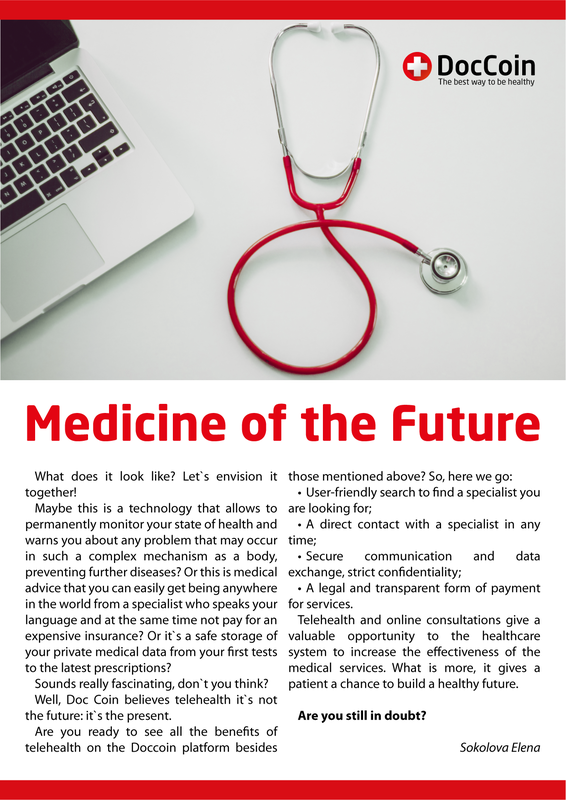 DocCoin expands the patient's capabilities allowing not only consultations with medical specialists and secure storage of medical data, but also referral to medical tests, prescriptions for medicines, sick leave certificates, communication with specialists from all over the world and remote health status monitoring. The network effect of the service is achieved by scaling the number of users (including patients, doctors, insurance companies, hospitals and etc.) which gives the client wide variety of health specialists to choose from and strong demand for services provided by doctors thereby creating an eco-system of users that tends to scale. 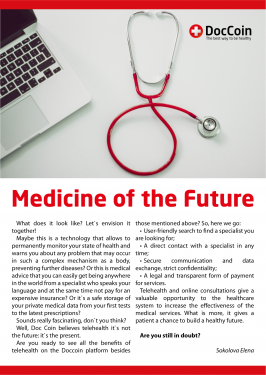 Use of DocCoin in the field of medical services will increase the safety of the medical data, make it easier to access patient’s data, help to gather separated bases into a single one as well as make the interaction of patients, doctors, medical institutions and insurance companies more transparent and convenient. These are very important and valuable advantages that will bring blockchain and smart contract technologies into the future of healthcare services.